If you already have a computer network set up in your home, then you have the basic requirements to have a connected home. 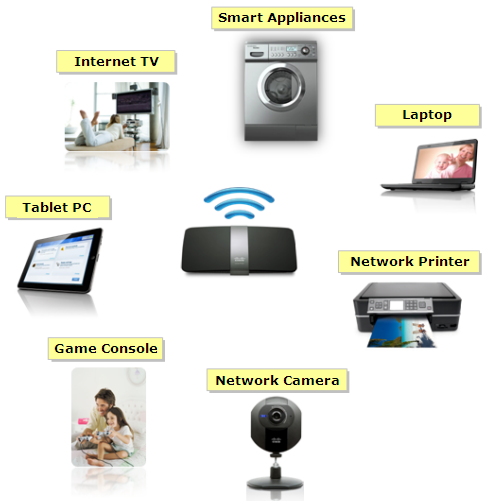 Ideally, a connected home is when the devices you have are all connected to the local area network (LAN) setup in your house. The LAN is a computer network in a small area which connects devices together using networking products such as routers. The devices may be connected to the network wirelessly or by using Ethernet cables. With this setup, all devices connected to the network will be able to share resources such as media files, informational data, printers, network access storage, Internet connection and many others. What are the benefits of having a connected home? How do you set up a connected home? After setting up your router, start connecting your Wi-Fi devices and appliances to the wireless network. All you need to connect wirelessly is the wireless network name (SSID) of your router and the password. The Linksys Smart Wi-Fi Account is the new service offered by Linksys which allows you to access your home network anywhere as long as there is an active Internet connection. This is designed to work with the new Linksys Smart Wi-Fi Router series. You can remotely access your router, monitor the activities in your network, set up parental controls or print documents on the network printer. This enhances the experience of a connected home setup. To know more about this software and the benefits of using it, you may visit the Linksys Smart Wi-Fi page or learn about its features by clicking here. NOTE: Older Linksys Smart Wi-Fi Router versions are shipped with the Classic web-based setup page. If you would like to upgrade its interface to the Linksys Smart Wi-Fi, click here to learn how. However, if you would like to learn how to simply upgrade the firmware of your Linksys Smart Wi-Fi Router, click here.